In Miaow There: It's Misty At Sea, Shelia Collins has once again given us a charming look at cruising. The book is a sequel to Ms. Collin's All At Sea With Truffles, part of the popular Truffles diaries series in which life is seen from the perspective of Ms. Collin's cat. (See review). Sadly, Truffles has gone on to the “big cat basket in the sky” and so this book is narrated by Ms. Collin's current cat, Misty. This change is narrator allows Ms Colllins to return to the topic of cruising with fresh insights while maintaining the style that readers found so pleasing in her earlier books. As in All At Sea With Truffles, this book is an account of a typical cruise. Ms. Collins is a frequent cruiser and so she is more than familiar with the topic. Combining this knowledge with her love of cats, she is able to imagine what would happen if Misty were to accompany her on one of her cruise holidays. The story is set on a fictional cruise ship, which many will recognize as a combination of Royal Caribbean's Independence of the Seas and Celebrity Eclipse. The cruise begins and ends in Southampton and so the cruise experience described is very much a depiction of modern British cruising. Whereas the cruise described in Truffles' book was to the Mediterranean, Misty's voyage is to Scandinavia. However, Misty is only able to observe the ports from her balcony as she is not allowed off the ship. She is of two minds as to this. Her feline curiosity calls her to explore these strange places. However, having never been out of her back garden in Cornwall before, she also finds the prospect of venturing forth frightening. Much better to relax on her balcony while Ms. Collins goes ashore. In Truffles' book, the cruise was a completely pleasant experience without any dramatic incidents. However, this time Misty experiences a disaster at sea. Laying in the sunshine on the balcony, Misty is suddenly doused with water from the automatic device that cleans the ship's balconies. Her cushion and her litter box are soaked but more importantly, Misty's fur is matted and unsightly. This is not at all acceptable for a cat who prides herself in being “immaculate at all times.” Retreating into the empty cabin, Misty is in a frenzy as she looks to remedy the situation. This leads to unfortunate consequences for the towels hanging just within reach in the bathroom. Misty gives us her observations on several aspects of cruising that were not discussed by Truffles. For example, she goes to shows in the ship's theater and in the ship's ice rink. Yet, the real difference between this book and its predecessor is the difference in perspective of the narrators. Truffles was a fat and lazy tabby cat. Misty is a self-described “petite and girly” cat. Thus, the two cats' views of the events that typically occur on a cruise and the people encountered during a cruise are quite different. Miaow There: It's Misty At Sea is available in electronic form only from the publisher Apex Publishing Ltd. and from major electronic book dealers. 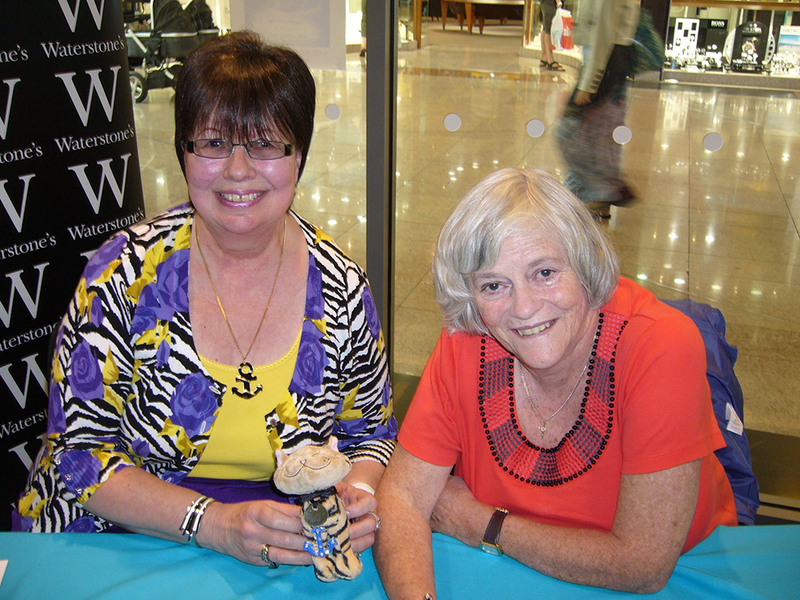 Above: Author Sheila Collins (left) with Ann Widdecombe who wrote the forward for Miaow There: It's Misty At Sea (Photos courtesy of Ms. Collins).